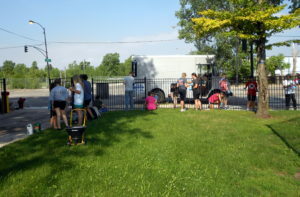 On the morning of July 4th about two dozens volunteers with YouthWorks showed up at McInerney Park to work on painting park perimeter fence, fertilize and killing weeds on the field, they also helped Coach Adam organize equipment and uniforms for the Canaryville Lions Youth Football. The group consisted mainly of youth from two churches and their adult leaders, and included two staff members from YouthWorks. All are staying at the Union Ave United Methodist Church (aka at the M.E. 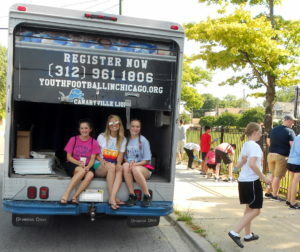 Church) and venture out every day during weeklong visit to volunteer around the city of Chicago. The M.E. Church has hosted a summer program with YouthWorks for twenty years. The two churches hosted this week were Heritage Church in Sterling Heights, MI and Crossroads Church in Fergus Falls, MN. 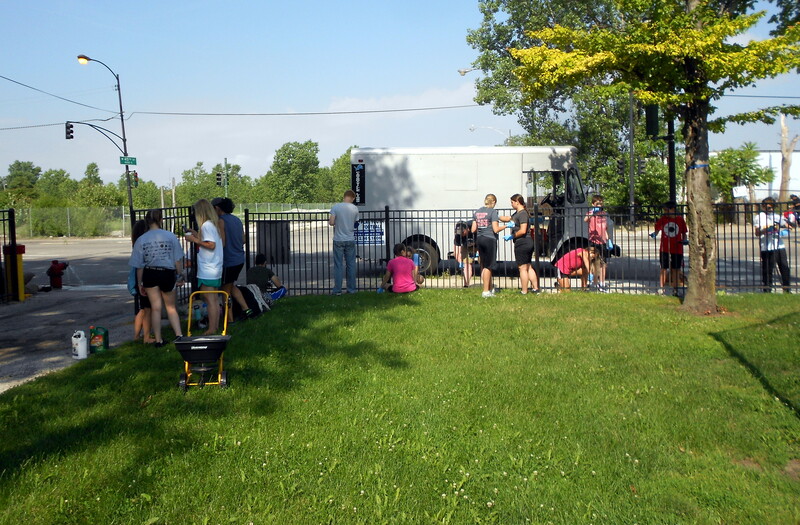 Although Heritage brought 32 young people, and Crossroads 20, many of the group’s contingency worked on other projects today so the team at McInerney consisted of 23 total, not including the two staff members from YouthWorks and two Lions coaches. Today’s temperatures were in the 90s with a heat index over 100 degrees, but volunteers had a boombox speaker and their spirits were high through out the day. They enjoyed coffee and donuts early on, drank bottles water to stay hydrated and pizza & pop for lunch. I spoke briefly to every adult and young person and asked their name and how they liked their visit to Chicago. 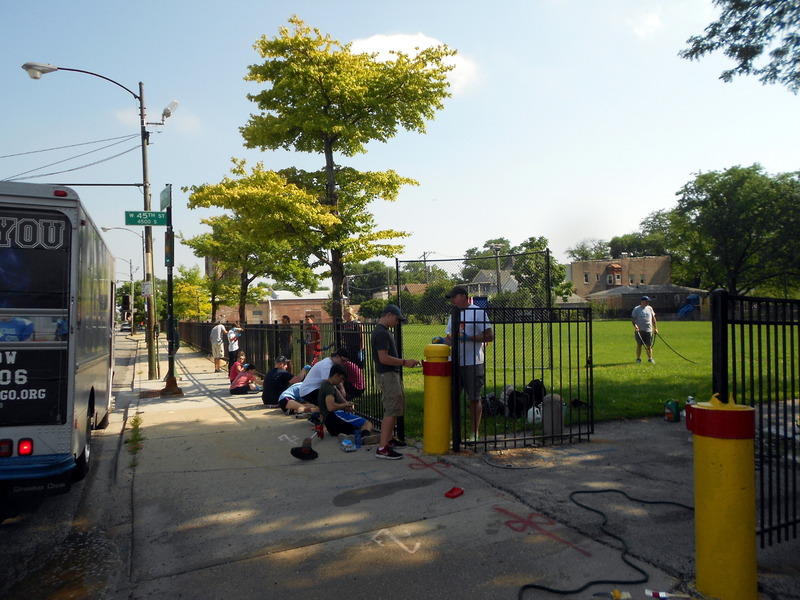 Everyone had a different name, but everyone agreed that they loved Chicago, the diversity of neighborhoods and many admitted their experience was better than was they anticipated. One of adult leaders from Minnesota said their town of 13,000 had more geese than people and chuckled when I told the neighborhood of Canaryville had just as many people! An adult leader from Sterling Heights found similarities with Detroit with regards to the perceptions of a “big city”. Below are pictures of those working at McInerney Park. Thanks to all those who helped on Independence Day!